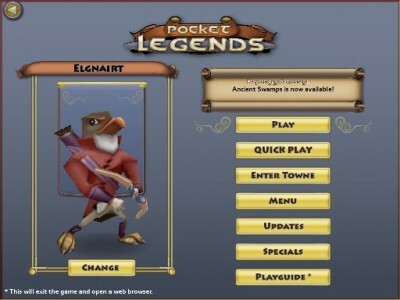 Pocket Legends’ main menu. 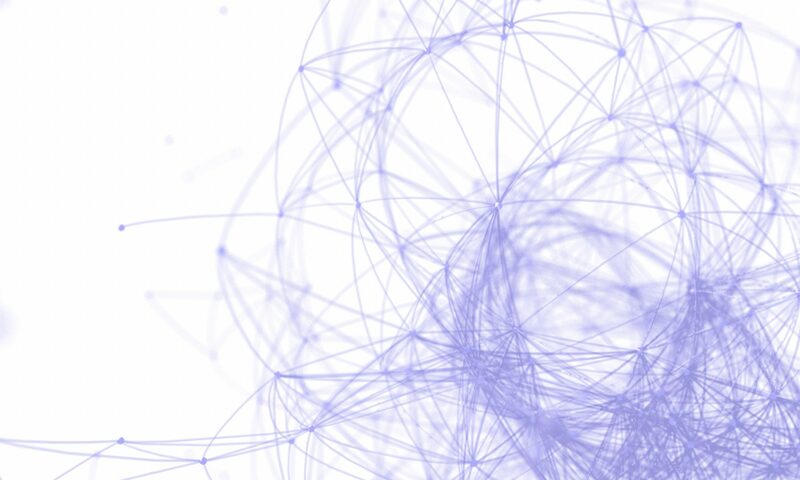 Just like WoW with 2% of the polygons. Over the weekend my wife and I spent a few hours playing Pocket Legends (Spacetime Studios) together. Pocket Legends is an [M]MO[RP]G for the iPad and iPhone. The “M” for massive is “bracketed” because it’s more like Guild Wars (et al) than EverQuest (et al) in that the multi-player aspect comprises “town” or instanced dungeons, where a player hosts the instance. The “RP” for “role-playing” is bracketed because there’s really no role-playing component to the game at al — no back story, no character customization, no quests. 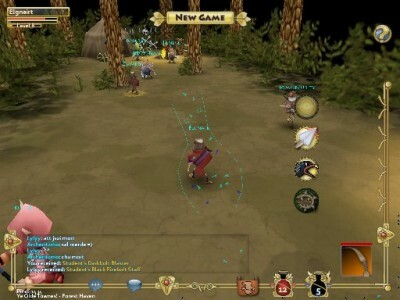 Even so, the basic framework of the game fantasy MMORPG. You can play one of three characters types: warrior (“Ursan” melee specialist), archer (“Avian” ranged or melee dps), or enchantress (“Elven” ranged dps and healing). My wife and I are playing enchantress and warrior (respectively) so we don’t know a huge amount about archers aside from seeing them in PUGs. To our eyes, they don’t seem to be a well-thought out class. (I started out playing an archer — I loved playing a hunter in World of Warcraft — and did not like it one bit). 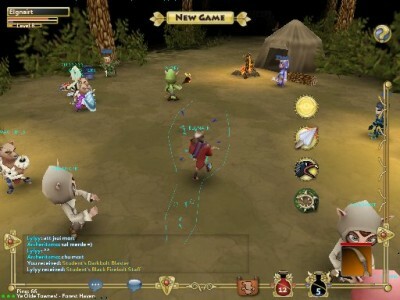 As they progress in level, the player can assign a character’s attribute points (five points per level, allocated among Strength, Dexterity, and Intelligence) and purchase and improve skills (you get access to a new skill every other level, and one point to spend buying a new skill or improving an existing one). Thus far there’s not much variety in skills — in many cases you’ll pick similar skills just to get different cooldown timers; and the only way to reassign skill points is to pay for a respec (currently $0.99), which is pretty annoying since skills can prove to be quite useless, and you can only have four available at a given time. Your inventory: helmet, weapon, clothes, shield. 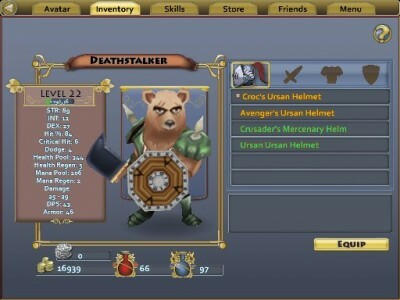 Characters also have four item slots: helmet, weapon, armor, and shield. Loot is allocated by some arcane semi-random process and no inter-character transactions are currently possible (although this is promised in 1.1 which is under review in the app store as I write this). Items come in varying grades: from white (ordinary), through orange, green, and purple, to pink (epic). The loot tables are fairly thoroughly broken — we’ve gotten quite a few purple and pink level 28-30 drops while playing level 12-15 characters, and on top of that you have no control over who gets what, so you’ll often see something you desperately want randomly assigned to your partner, who can’t use it and can’t give it to you. (For now.) Also, right now there’s no special benefit for killing bosses. Loot drops appear to be utterly random. The gameplay in Legends is very simple. If you touch and drag you orbit the camera around your character. Pinching (sometimes) zooms the view in and out. Everything except the walk-and-kill game is menus *. Note: * Spacetime’s website says that their game engine uses Scaleform gfx, which is a library that lets you author UIs in Flash and then performs the necessary rendering using a custom engine — which seems to me to be about as massive a violation of 3.3.1 as might exist; it’s also entertaining since Scaleform has plainly implemented a highly efficient, cross-platform, hardware-accelerated Flash-rendering engine — a feat that has escaped Adobe and Macromedia before it. I suspect that they aren’t using Scaleform on the iPad/iPhone, however. To attack the nearest enemy you touch an on-screen button, and (by default) you run into range and auto-attack until dead. While auto-attack is on your toon will try to keep an enemy in range — this can become quite treacherous because a lot of enemies with ranged weapons are quite smart about backing out of melee range, which can get warriors into deep doodoo. To attack a specific enemy you touch it which, when it works (about 33% of the time) targets the enemy (which is indicated graphically), and the use the auto-attack button or an offensive power. To use a power (you can have up to four available) you tap its on-screen button. Frustratingly, using an offensive power on an enemy does not, right now, switch on auto-attack. When you die (and you will die), you can respawn at the entrance of the current dungeon (and so far no dungeons have been terribly large) or, if an enchantress is near your body you can be revived. In practice, a warrior will simply charge into a group of enemies and beat them to death using a combination of straight melee attacks and a point-blank AoE power that knocks back enemies and has a chance to stun. Enchantresses will use a combination of single target and AoE spells, some of which snare, some knock back, and so on. Warriors can AoE “taunt” and do a pretty good job of “holding aggro”. Players can spam health and mana potions to restore their own pools. Archers can shoot enemies of comparable level pretty much to death before they can run into melee range (obviously, ranged enemies will get a few hits in). One very nice feature of the game is that different characters’ abilities can create combos. E.g. if the enchantress snares a bunch of enemies with her AoE frost spell and then the warrior uses his stomp in the same area (AoE damage, pushback, and chance of stun) affected enemies are “shattered” (i.e. take lots of damage), which is fun and gratifying. From what I can tell, when it first came out, archers were extremely overpowered (in particular, they were very strong in melee) and warriors were complete gimps (hmm, sounds a lot like World of Warcraft). As far as my wife and I can tell right now, warrior and enchantress is a very solid combination; we suspect archers are the best soloing class. Almost everything: quests, non-dungeon areas, back-story, variety, customization, etc. — but nothing that can’t easily be added later. As of the 1.1 Patch, going to town now actually serves a purpose. Instead of being able to do all your shopping from the game menu, you now need to visit vendors in town to buy most things (and access your stash). In essence, Legends is a game skeleton. It obviously has a huge amount of potential, but right now it’s a very basic Diablo clone (albeit with auto-attack, thank goodness). The content is incredibly repetitive (e.g. I think we’ve seen a total of seven kinds of monster and two kinds of terrain having bought two content packs) and, for what you get, not especially cheap ($1.99 for dungeon packs spanning five levels, which amount to perhaps two hours of gameplay, $0.99 for individual spiffy items like swords and breastplates, $1.99 for item “sets”, and $0.99 for miscellaneous things such as respecs, which are virtually compulsory given the way the skill system works). That said, what’s there works pretty well and looks pretty good. Yes, variety and depth are lacking, but the same can be said for the $60, rave-reviewed X-Box 360 game Borderlands (which I’ve played quite a bit). As Yahtzee puts it — “shooting the same four or five guys in the face fifty thousands times”. It’s fairly clear once you download the free base game that Spacetime’s business model is “let’s try charging for absolutely everything and see what sticks”. Judging from their forums, what people want is more content, and what they’re willing to pay for is more content. Aside from content, the only thing we’ve bought is a new robe for my wife’s enchantress so she doesn’t look (exactly) like every other enchantress. I’d say the results there are mixed. Playing the game is free, except that content beyond level 10 costs $1.99 per five levels worth*. (And, as far as we can tell, you’ll have to repeat that content quite a bit to advance five levels.) Playing as a duo, we’re able to handle content three-to-five levels tougher than par. Because this is the iPhone/iPad world, you only need to buy content once per account, which means we’ve paid $5 (roughly) for two expansion packs and a robe, and both of us can access the expansion packs. When you consider that World of Warcraft costs two people $30/month just in subscription fees, it’s quite a bargain. Note: * it’s now “10 plat” where 5 plat costs $0.99, but buying more gets you increasing discounts, up to 800 plat for $49.99. Similarly, content is now available in discounted bundles.